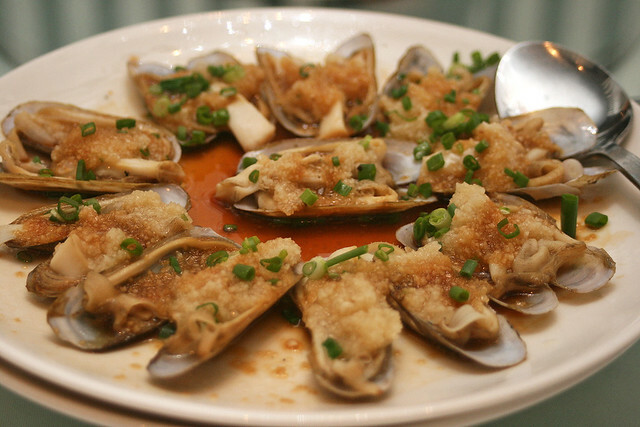 It's the middle of spring, and no better time than now to enjoy bamboo clams from the scenic coastal town of Putian in the Fujian province of China. 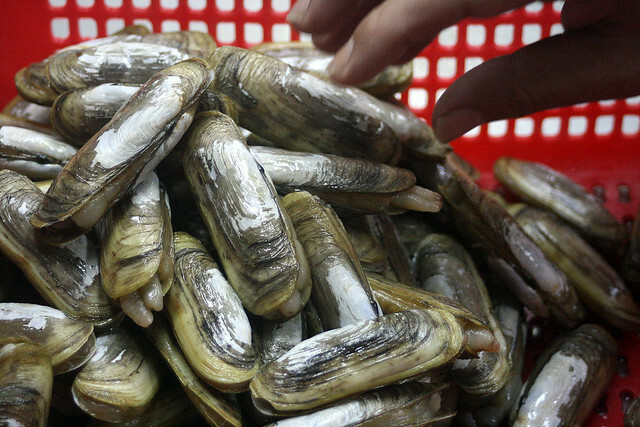 These particular bamboo clams are are at their best between March and May, although they are available until September. You probably won't be able to find these in your regular wet market. They are specially flown in from Putian by Putien Restaurant two to three times a week. 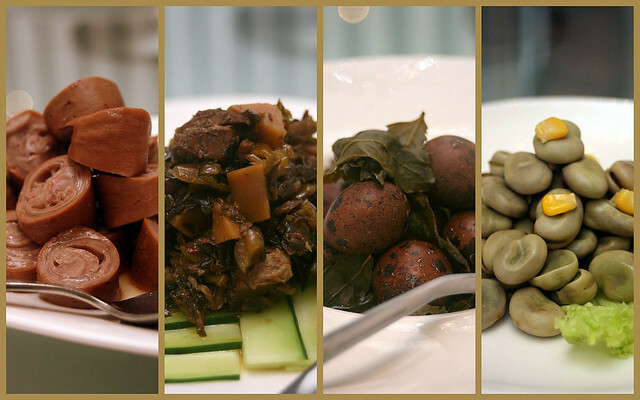 Putien specialises in Heng Hwa cuisine from Fujian, which traditionally is more light and down-to-earth. 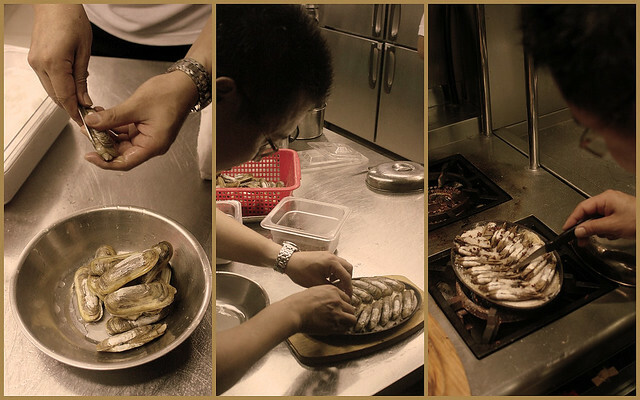 At a media tasting showcasing their latest spring menu, Putien also showed us how they process the bamboo clams. 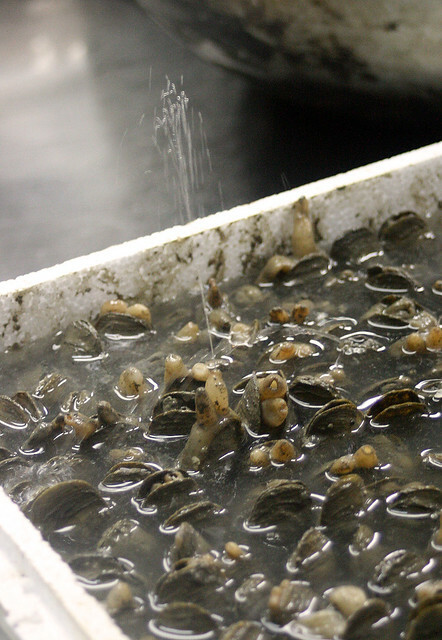 The bamboo clams are packed straight from where they are harvested and shipped in a special ice box, suspended in a semi-frozen "hibernating" state. When they are revived in salt water, they spout water like little fountains in a self-cleaning process! But of course, they are scrubbed and rinsed repeatedly until really clean. Each of them is cleaned individually. The very cheerful and affable executive chef (who is from Putian) demonstrated how they prepare one of the bamboo clam dishes. 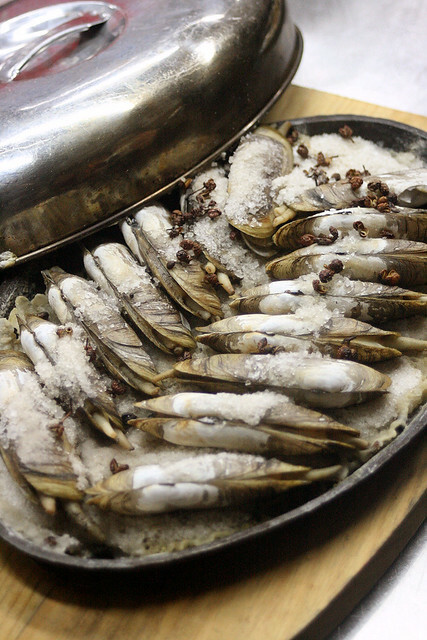 He cuts their shell, arranges them on a bed of salt upon a hotplate, and cooks them on a stove (it's later covered and baked). A few Szechuan peppercorns are added for a spicy hint. Baked Bamboo Clam on Hot Plate - the finished dish. The clam shells seal in all the juices. Hold the clams vertically, pull the flesh out by the double spouts and dab them in a little bit of salt. Fresh seafood sometimes needs little else to taste really good. Then again, you can also go the whole hog with minced garlic and savoury soy sauce! 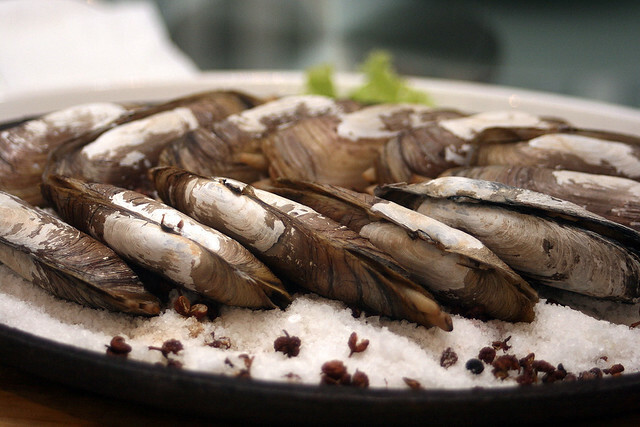 Steamed Bamboo Clams with Minced Garlic is one of the seven ways they prepare this seasonal dish. You can also choose to have bamboo clams in Soup, as Omelette (like oyster omelette! ), steamed in Wine, stir-fried with Ginger and Spring Onion, or fried Salted and Spicy. We also got to preview some of the Spring Menu items. Putien is celebrating spring with tea-scented dishes, using newly harvested Da Hong Pao Oolong tea leaves. 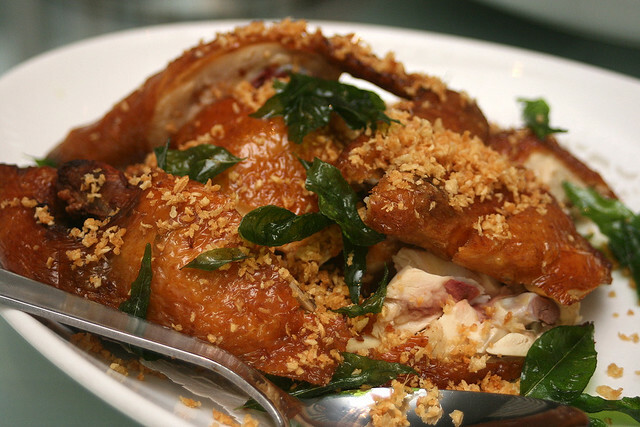 Set menus range from S$68++ for two, to S$488++ for 10. 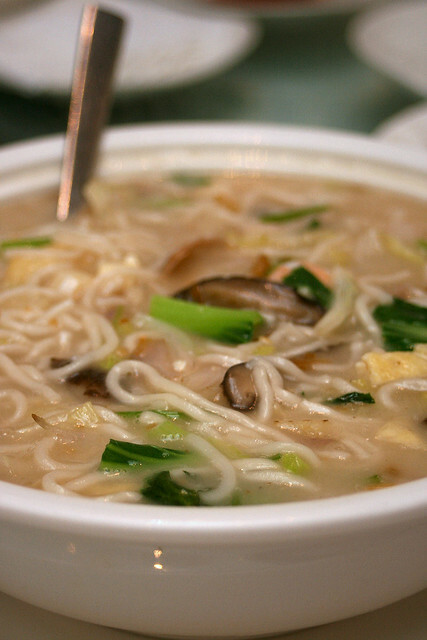 Double-boiled Chicken Soup with Abalone - deliciously clear and fortifying. 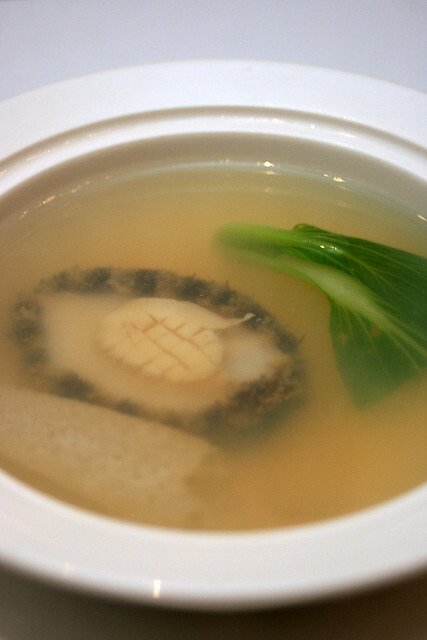 The tender little abalones come from Putian, which is well-known for them. Four Spring Appetisers - braised pork intestines, Ah Po Pickled Mustard Cabbage, Tea Leaf Qual Eggs, and Five Spice Broad Beans. 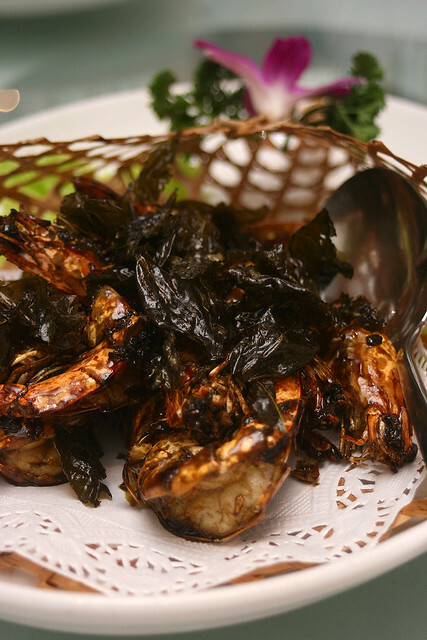 Tea Leaf Prawns - the prawns are fried with tea leaves for a light smoky sweetness. We all voted this our favourite (until of course the signature beehoon made its appearance). Putien kindly gave us the recipe (see separate post). 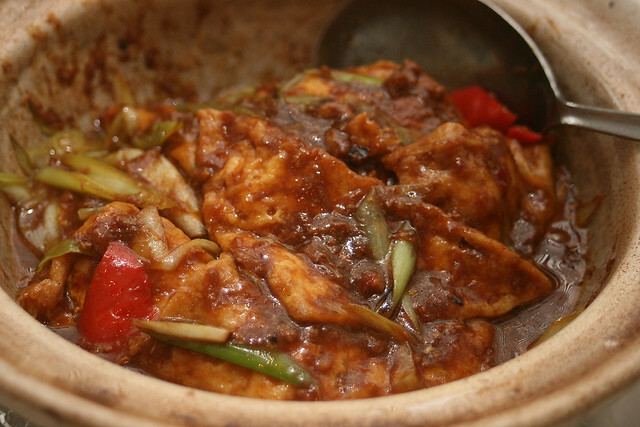 Braised Tofu with Minced Meat - a dish that looks very home-made. Might appear a bit more messy than the rest, but it is tasty! The kind of thing that makes you ask for more rice. Deep Fried Chicken with Garlic - not exactly traditional Heng Hwa cuisine, I believe, but it does satisfy the Singaporean penchant for deep-fried/roast chicken. 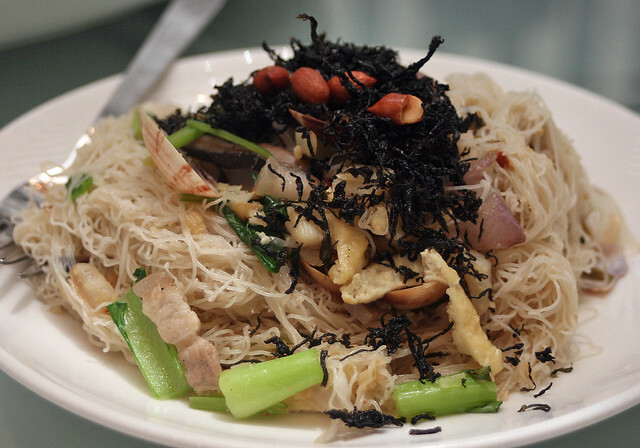 Fried "Hing Wa" Bee Hoon - one of their best-selling signature dishes. The extra-fine beehoon is imported from Putian, and it's also available for sale, should you want to try your hand at making some at home. Hint: don't soak the dry rice vermicelli in water, but toss it in straight away in good stock, until it's absorbed all the water (and flavours)! 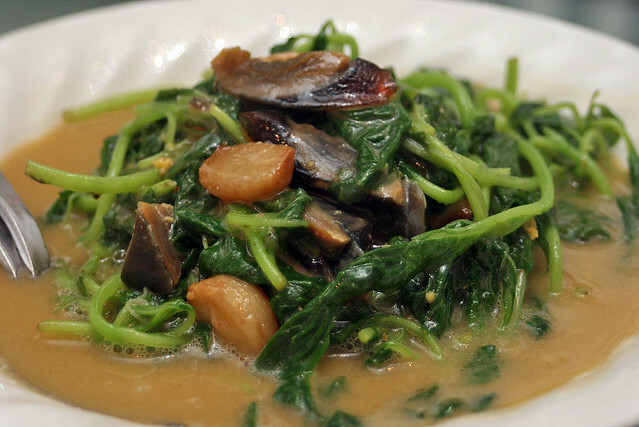 Spinach with Salted Egg and Century Egg in Supreme Stock - part of the regular menu, and one of my favourites. It's so much more robust and savoury than those served in Cantonese restaurants. Putien Lor Mee - surprisingly this turned out tops in an online poll with customers on what their favourite dish was. Unlike the Hokkien lor mee which has dark gravy, this Heng Hwa version seems a little healthier with more vegetables, mushrooms and seafood. 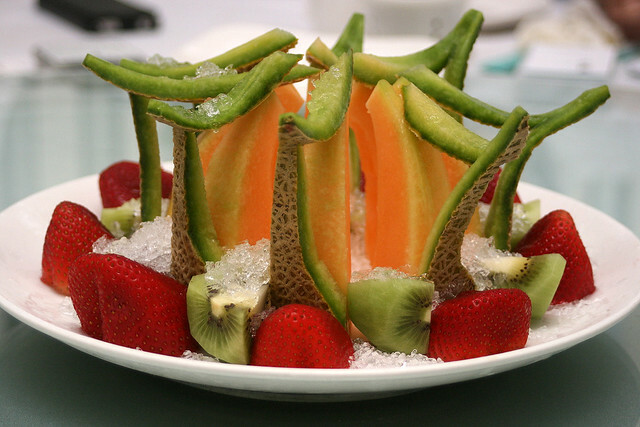 Spring Fruits, also beautifully presented. Pity the seasonal Putian loquat had not arrived yet, but the strawberries more than made up for it! Incidentally, for Mother's Day and Father's Day, Putien will bring out seven new dishes featuring ingredients like cordyceps, red date and bird’s nest. These include (as shown below, photo from Putien) Steamed Lobster with Minced Garlic, Baked Scallop in Egg White, Wild Bamboo Pith with Asparagus and Chilled Bird’s Nest with Pear. Diners will receive a limited edition Spice Mum Gift Set with a minimum spend of $200 on May 7 and 8 while stocks last. The Mother’s Day menu will be available May 1 to 31 and the Father’s Day menu will be available June 1 to 30. Warmest thanks to Ringo of Putien, and Geraldine and Anne of linea Communications for the preview lunch and bamboo clam adventure! You were great hosts! Putian is getting innovative!! !at least they manage to keep their food consistent despite mushrooming across the island. Great review! Thanks! Yes, Putien is very consistent. I like that their food is a little bit different from your regular Chinese restaurant.